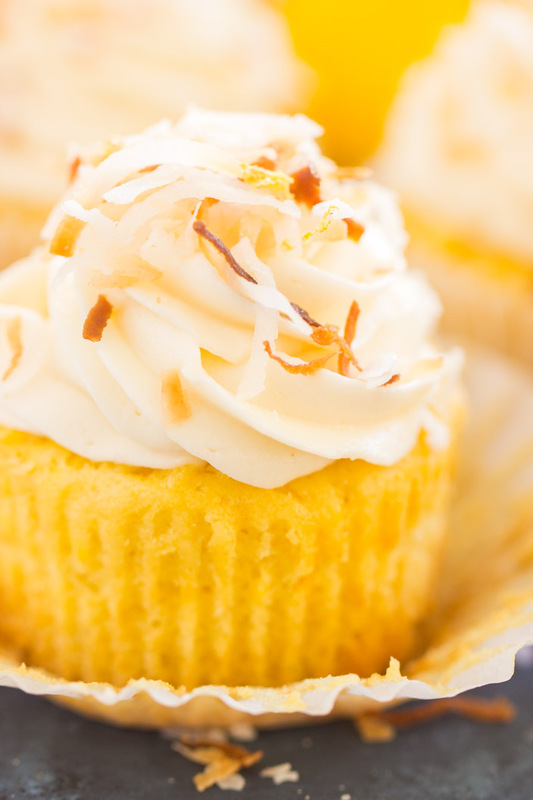 These Lemon Coconut Cupcakes are bursting with lemon and coconut, through and through! 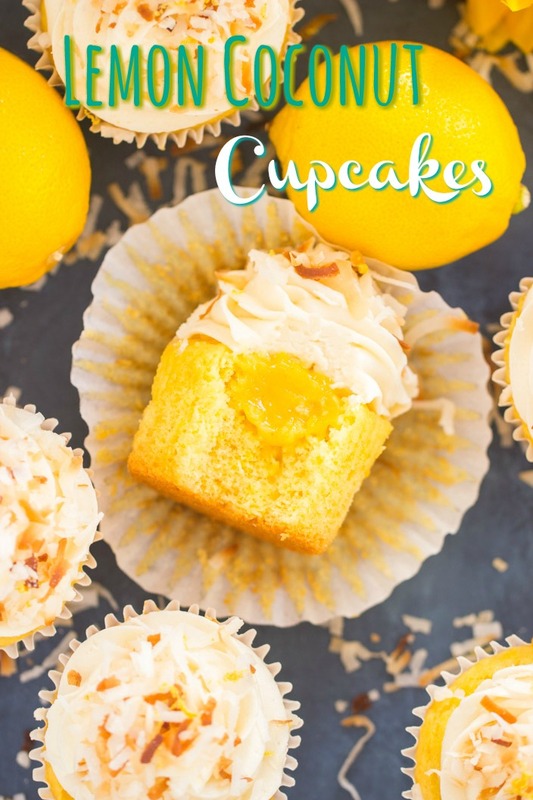 With both key ingredients in the cupcake, a sweet & tart lemon curd filling, and a thick, creamy coconut cream cheese frosting on top. These Lemon Coconut Cupcakes will certainly get you in the spirit of spring. Good morning! I’m such a slacker lately. I vowed that I’d put less pressure on myself this year when it comes to blogging, but I’ve really run with that. I have so many recipes ready to go, but I’m terrible about getting them up lately. These Lemon Coconut Cupcakes? I think I made these in January. 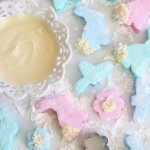 I am very prepared for spring and summer baking, I just need to hit the ‘publish’ button more often. I must say, it’s been nice to have a life again though. Most days, I spend almost every spare minute working on this blog, and I’ve cut back for the last few months just to have some life balance again. I’ve gotten A LOT done around my house, which is great. I feel more organized than I’ve ever been! Also, we have two 9 month-old kittens, so I’ve spent time playing with them and enjoying them while they’re still small…. ish. They’re getting pretty big though. They’re CRAZY playful, and so it’s super fun to have kittens around. Speaking of kittens, we’ve started fostering for a local rescue group, Rebel’s Rescue, and I have four 3 week-old black kittens living in my bathtub. We’ve also got the friendly Mom – she’s a tuxedo. If anyone would like a kitten/young adult cat, please do let me know. I’m in Tampa, and willing to drive a few hours to get one (or more!) to you. Seriously…. I guess you’re not here for kittens (why not??? 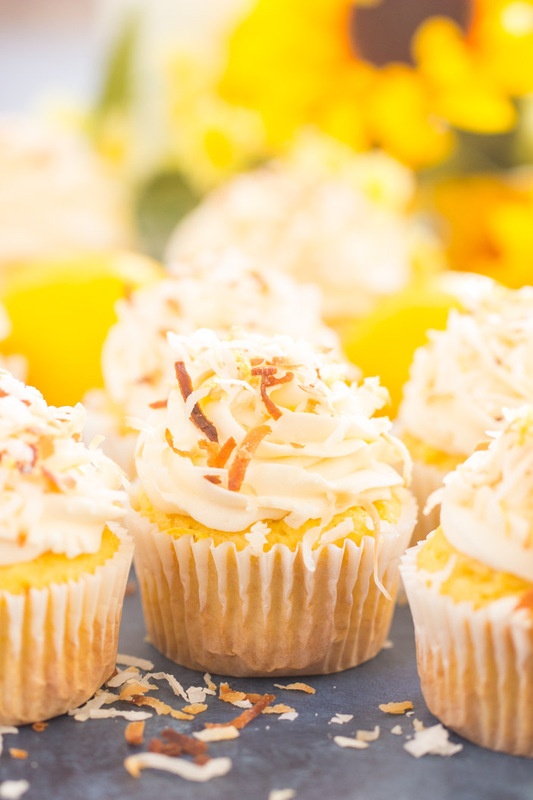 ), so onto these Lemon Coconut Cupcakes. 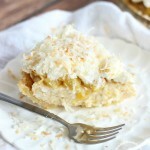 Lemon cake mix + coconut pudding mix (easy to find!) 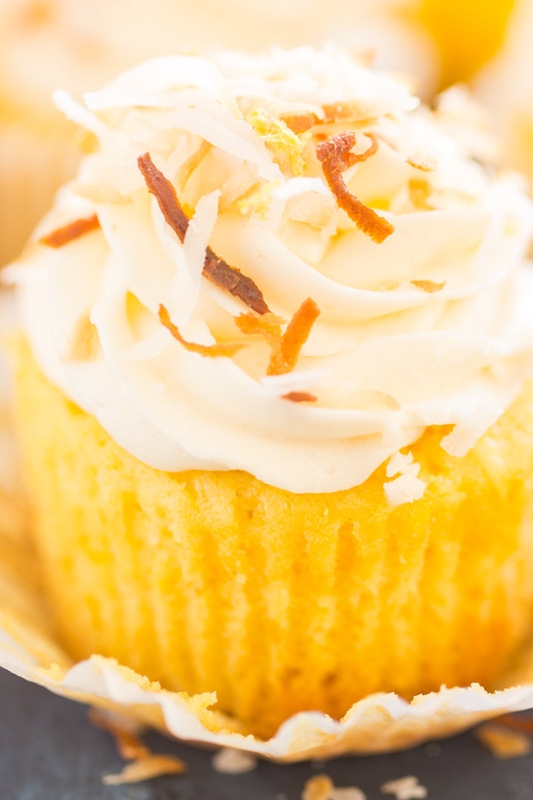 combine, with a few other odds and ends, to make the perfect lemon and coconut cupcake! The cupcakes are amplified with lemon flavor thanks to fresh lemon zest. They’re moist and ultra-flavorful, but they’re also a denser crumb, which is great because we want a slightly sturdier cupcake for filling it, and loading it up with frosting. Don’t get me wrong, they’re still fluffy. I used egg whites only when doctoring up the cake mix, and it makes for a lighter cupcake. What will we do with the egg yolks though? What else?? Lemon curd! It’s no secret that I’m obsessed with making citrus curd when I have leftover yolks. You’ll use 4 whole eggs in this recipe – the whites in the cupcakes, and the yolks for the curd. It works out great. Each cupcake is filled with a dollop of homemade lemon curd. I freakin’ love that stuff. So tart, but really sweet too, super creamy, smooth, and luxurious-tasting. 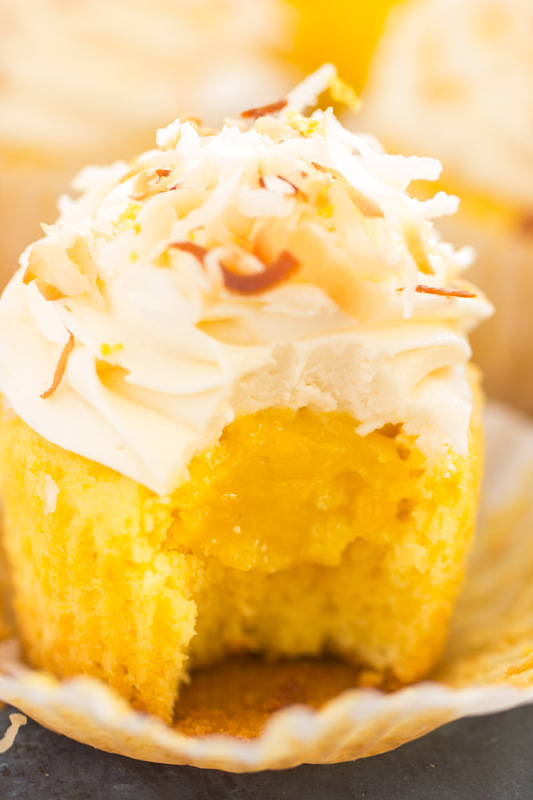 It’s such a pleasant surprise to bite into one of these cupcakes to find a burst of vibrantly tangy filling. Top these Lemon Coconut Cupcakes with coconut cream cheese frosting and toasted coconut! I’m on a kick with cream cheese frosting, I just can’t get enough of it lately, and when done right, I’m convinced it’s superior to all other frostings (oh, but Brown Butter Frosting and Nutella Buttercream… how can I say it’s better than those?). It’s just that it’s so exceptionally creamy. I spiked the cream cheese frosting with a few teaspoons of coconut extract, and we’re good to go. 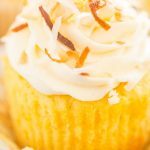 These Lemon Coconut Cupcakes are lemony and coconutty, through and through, but they’re simple to pull together (really! ), and they’ll 100% get you in the spirit of springtime. 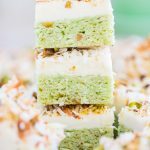 Interested in other great springtime recipes? Check out this Lemon Blueberry Bundt Cake with Lemon Glaze, this Lemon Chess Pie, these Iced Lemon Amish Sugar Cookies, or these Toasted Coconut Amish Sugar Cookies! 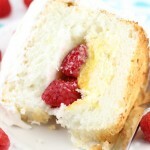 In a large bowl, whisk together cake mix, pudding mix, water, egg whites, lemon zest, and oil. Fill muffin cups 2/3-full with batter. Bake at 350 degrees for about 20 minutes, or until edges are golden, and a toothpick inserted near the center of a cupcake comes out clean. Meanwhile, prepare lemon curd filling. In a small bowl, whisk together egg yolks, lemon zest, lemon juice, and sugar. Transfer to a small saucepan. Cook over low-medium heat, stirring regularly, until mixture thickens and coats the back of a spoon, about 5 minutes. Remove from heat and add the butter. Stir until smooth. Beat in vanilla and coconut extracts. Add 4 cups powdered sugar, beating until thick and creamy. Add additional powdered sugar, as needed, to achieve a frosting of medium consistency. Creamy, but thick and pipeable. Using a small teaspoon or grapefruit spoon, carve a 1-inch ball out of the center of each cupcake. 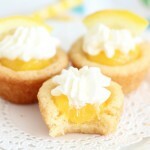 Using a small teaspoon or small cookie scoop, dollop a rounded teaspoonful of lemon curd into the center of each cupcake. Frost cupcakes. I used a piping bag fitted with a large star tip, Wilton 1M. 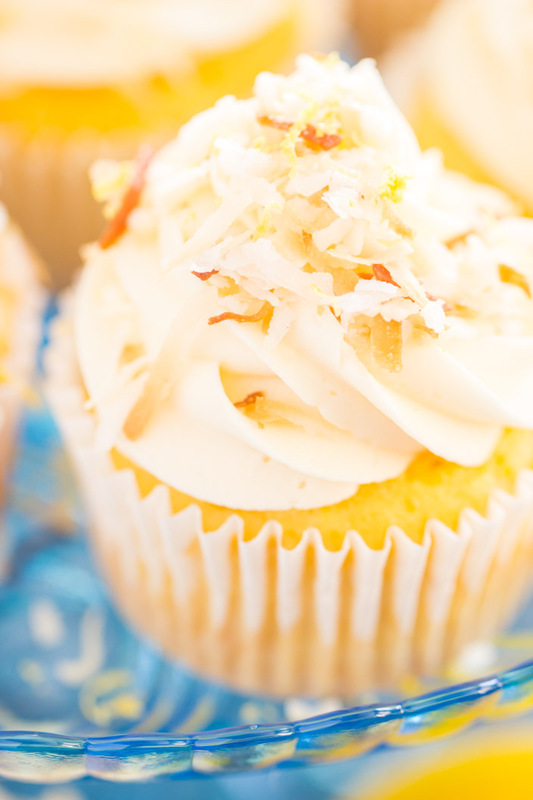 Sprinkle cupcakes with toasted coconut.